Location: The BalneoComplex 'Medica-Narechen' is located in one of the most beautiful sites in the Rhodope Mountains. The region provides mild climate, curative mineral water springs and beautiful nature. The BalneoComplex 'Medica-Narechen' offers additional services to its guests - secure parking and external staircase for robotic wheelchairs. Medical centre "Medica Expert” at the BalneoHotel 'Medica-Narechen' works with leading experts in physiotherapy and skilfully combines the healing properties of mineral waters and nature with modern advances in medicine. The Centre has well equipped surgeries, manipulation surgery, and rooms for physiotherapy and remedial gymnastics. Each patient is assigned an individual, complex medical - rehabilitation program which includes: - Medical examinations by highly skilled team of doctors. 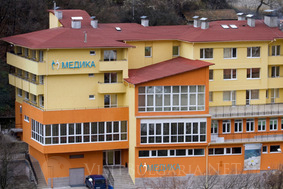 - Apparatuses physiotherapy and complex of exercises, conducted by a specialist physiotherapist.